It's all about the light in this lovely two bed, two bath unit at the renowned National Condominiums in Old City. Light bright walls, east facing windows with the early morning sun and dusk drenched auras are what you will enjoy here, not to mention the lovely view of historic Elfreth's Alley crowned in the distance by the soaring peaks of the Ben Franklin Bridge-- quite a lovely study of contrasts. 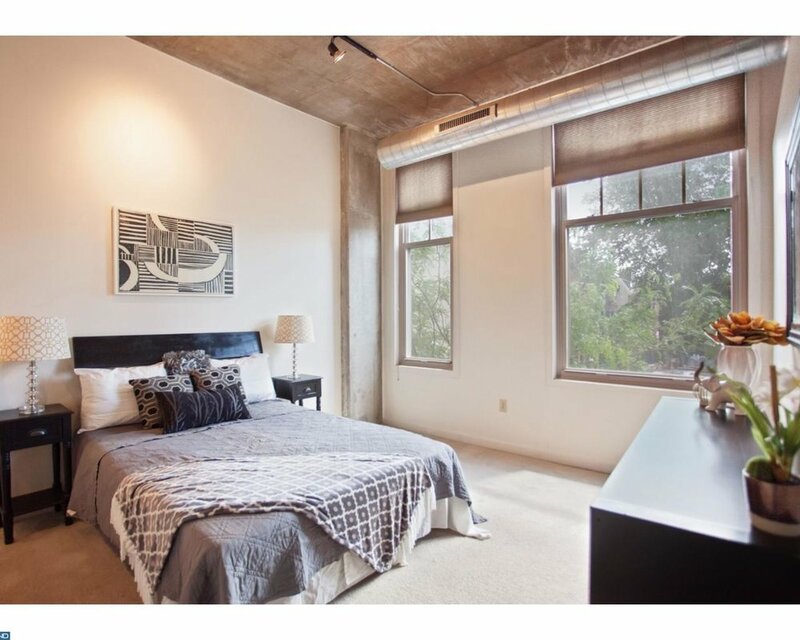 The unit boasts all the modern elements of a contemporary lifestyle: natural wood floors, elegant dark wood cabinetry, granite counters and stainless steel appliances, high ceilings adorned with track lighting and an open floor plan. The guest bedroom, complete with a cut-out window and large closet, sits across the hallway from a full bath outfitted with a tub/shower ensemble and tile surround. The master bedroom sits at the front next to the living area and features two master closets forming a hallway to the en-suite bath featuring double sinks and glass enclosed shower. The Eurotech washer/dryer units are located in a separate laundry closet, complete with shelving and extra storage space, located in the main hallway leading to the expansive living room. The kitchen and living room form an open floor plan and sit at the front, boasting those lovely East facing windows, and views. One deeded parking space is conveniently located near the elevator and the other is nearby on the first level of the underground garage. The National is a gated community with impeccably maintained grounds, covered parking, and an on-site management office. Old City is known for its cultural highlights, historic attractions, restaurants, cafes, boutiques, walkability, access to public transportation and major roads leading into and out of the city.